2012 | Tired, Need Sleep. Advent is almost upon us! How did that happen?! I hope you are all more on top of your holiday planning and gift buying/making than I am… oh my. I’d forgotten just how much time caring for a newborn takes. Totally worth it of course (but I do miss blogging)! I’ve had about a dozen emails in the past few days asking about this year’s Jesse Tree packet. Thank you all so much for reminding me to get this together! I needed that little push and it is nice to know many of you use it. Thankfully it was super-easy to put together this year. Last year Advent had 27 days – the maximum number of days possible for any year. So this year I am re-publishing the pack of ornaments, prayer cards, and Scripture references we used last year. You will have 4 extra ornaments, etc. because Advent is only 23 days this year (it begins on Dec. 2nd). This is the schedule my family will be using. We have taken out the ornaments for the second, third, and fourth Sundays as well as the ornament for the prophet Daniel. All the other ornaments will be used in order, showing the lineage of Jesus and the history of his plan of salvation (from the creation of the world to his birth). However, if taking out 4 different ornaments/cards makes more sense for your family, feel free to make up your own schedule! I feel it’s important to keep in all the people that were Jesus’ ancestors, so I take out the Sunday ornaments and then begin taking out prophets until we’ve reached the correct amount of ornaments for the particular year we are in. Click the image below to download the pack of ornaments, prayer cards, and Scripture references. Have questions about the Jesse Tree? Please feel free to leave them in the comments. I will do my very best to answer them! Joseph Daniel – born at 5:48 on 8/13/2012. :) He weighed 8lbs, 8oz and was 21.5 inches long (just like big brother in length). He is perfect and so, so precious. We are so blessed! Just a quick note to let you all know I've set up a new website (Google Sites) for all the - over 100! - printables I've created over the past couple of years. It is much, much more organized than the blog page that you had to scroll through previously. I hope you find it user-friendly! The url is https://sites.google.com/site/learningbyheartprintables/, and there is even a cute little button for it over there in the left sidebar. 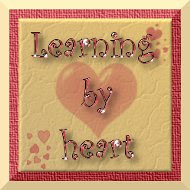 I've named it Learning by Heart since that's the title I've used for all our learning posts. I have a couple of other exciting news items to share with you all (including baby's arrival at some point), but want to get all my ducks in a row first. Enjoy the new printables website and let me know what you think of it! The general consensus amongst those of us in this situation seems to be that, hidden behind the ever popular “socialization” worries (which can be pretty easily refuted), is this idea that we really just don’t want our children to become independent… we are anxious, hovering mothers, who can’t “let go” of our babies. This frustrates me to no end because if all the people in my life truly knew what an introvert I am, and how much I value time to myself as well as peace and quiet, they might have an idea of just how hard it is for me to do what I am convinced is best for my child. I am a very selfish, self-centered person, and it is a daily struggle, battle even, to do what I see as my vocation, and do it well. I am convinced, however, that joy and peace are found in doing what I feel is right instead of simply what I feel like doing. The first path is based on thoughtful discernment, and the second is the one really based on emotion. It’s hard to be in a place where your motherly intuition is telling you what your child is and isn’t ready for, which style of education might be best for them, and which lifestyle might be best for your family; and yet to be misunderstood and not taken seriously by those around you who tend to see you as a hindrance to your child’s growth instead of seeing you as an advocate for the healthy growth of each individual child. Personally, I think much of this stems from a general misunderstanding and lack of respect for the importance of motherhood in society today . But that is another (very opinionated) post for another time. I recently came across a book titled, The Well-Adjusted Child: The Social Benefits of Homeschooling, by Rachel Gathercole. In it she discusses this idea of “parental proximity” and why it’s not necessarily a bad thing. In fact, it might be a good thing! Perhaps our current culture doesn’t understand because it views the family unit itself in a rather poor light. I want to share some of what I’ve read with you, as I found it very encouraging and interesting. “… I believe the decay of family unity is at the heart of many of the social problems our culture is facing today. Our culture is in a hurry to rush [little children] off to school, where they are placed in a room full of ten to twenty other little children with only one or two teachers. Then parents are shocked and horrified when these same children, years later, have become completely peer dependent and cannot identify with their own family. But peer dependence is the natural outcome of [this type of] education because a child has a real and intense need for relationship. When that need for relationship cannot be met by an adult (a teacher who is working with many students), then the child will turn to the only other available person, the peer in the classroom. Consequently, a child comes to value the opinions of his school-age peers more than those of his family… Our children are starving for meaningful relationships and will engage in all kinds of unhealthy activities and behaviors to fulfill that innate need for intimacy. What a tragedy that we have divided the family for the sake of ‘education.’ Strong family relationships and unity are at the heart of healthy communities – the latter cannot exist in the absence of the former.” – Amy, homeschooling mother of three, upstate New York. “The idea that early and abundant independence from parents is desirable may be part of an overall societal pressure on kids and parents toward early, forced independence… More and more research is showing, and parents are discovering, that strong attachment bonds between child and parents, not forced independence, creates happy children and healthy socialization. Healthy independence just happens when it naturally should happen. It does not need to be rushed into or forced. “We all want our children to be able to face life challenges, peer pressure, and all the evils of the world with strength and integrity. They have a much better shot at this if they have the time and support to develop and grow first. Children cannot make wise choices until they have the perspective and information about themselves and what’s in front of them. When they are young, they are mostly influenced by their environment. It takes time for them to be able to understand an issue to be able to make judgments about it and to act in their own best interest and in the interest of others. The entire book is well worth reading, by the way, and I hope the little bit I’ve shared here motivates some of you to read it for yourself. You can find it here. It would be an excellent resource to hand to someone who has honest questions about the socialization of homeschooled children. Have a beautiful day with your beautiful children! We are looking into registering M for kindergarten this fall at the private school associated with our church. A little word of advice to any husbands out there: If your wife is very, very pregnant, and her first child is also getting ready to start kindergarten – this might be too much for her, especially if she is unsure that this is in his best interests. Don’t send her out to get info, tour schools, or sign registration papers on her own. She just might not be able to force herself to do it. Regardless of how much you might think you are on the same page, there is no guarantee that a mama in this situation is not going to just flip to another page or switch to an entirely different book altogether. And if she’s pregnant, don’t expect to get many coherent thoughts out of her when she’s in the middle of crying. She might be the most practical, articulate, logical-thinking woman on the planet, but when you’re talking about taking her heart of our her chest and handing it over to someone else, you are not likely to get the most objective of responses. So. I’m not sure what I want the point of this post to be… maybe it’s just an opportunity to vent (code for: ramble on and on while I indulge in self-pity and defensiveness), or an attempt to think things through on virtual paper so I sound a bit more coherent than the usual “wah, wah, sob, sob… my baby!” that I’ve been doing of late. If you can stick with me, your comments are welcome! First of all, I believe with all my heart, that parents have a very serious God-given responsibility when it comes to the education of their children. It is such a serious responsibility that they need to take time to figure out what their own thoughts, beliefs, and philosophy of education are, and then diligently seek out the best way of giving their child this sort of education. It’s more than just saying, “Well, he’s six years old now, time to go to school!” and then sending him off. It’s more than basing the decision of where to send him on something as simple as “do they have half-day or whole-day kindergarten?” or “do the start and end times work for our family and transportation?”. These things might be important, but really, they shouldn’t be the whole basis of decision. If we are going to be held accountable for the education of a child’s mind, heart, and soul – and we are, I believe – then we’d better be pretty darn serious about the details of it. So, if and when we have thoughtfully (and prayerfully) made the huge decision to delegate this responsibility of educating our children to someone else, it’s our right to know what that someone else is going to be teaching them, the style of teaching, and various other things. I was disappointed to learn that the particular school we are looking at uses computers and other screen technology, quite often, to “teach” 5 and 6 year olds. I just don’t see how this is the best way for children of such a young age to learn. Why is everyone impressed with technology in schools? Does it help the child learn to think or is it simply glorified worksheets and busy-work? Isn’t it likely that most small children will become so enamoured with the computer itself that the actual learning of the material will take a back seat? And shouldn’t children be doing more hands-on learning activities anyway? Any technology they learn now will most likely be obsolete by the time they need to prepare for a job. I just don’t get it, especially given the damage (yes, damage) that this sort of impersonal education can do to someone of such a tender age. I’m a big believer in intuition and instinct… and intuitively I have a problem with government telling my family that we must now send our child away for several hours a day for the next 13 years in order to educate him. (By the way, I’m not crazy for thinking this way – there were many parental protests when schooling first became compulsory in Massachusetts in 1852. Little by little those voices were ignored and quieted and now society simply sees this as the "way things are”, but compulsory schooling and our current system of schooling in institutions is a pretty recent development.) Let me be clear – I am pro-learning! Learning is what childhood is all about. Learning takes guidance and direction by someone… but ideally that guidance and direction is geared towards the individual child – his abilities, needs, interests, etc. Individuality – the dignity of each person’s uniqueness – is highly disregarded in today’s society and nowhere more so than in schools where children are lumped together and taught the same thing at the same age - things decided by people who do not even know them. Teachers do their best to get to know the children and help them learn, but there are so many handicaps blocking their way that it’s difficult for even the best teacher to achieve this for each and every student. Anyway, back to government being involved… I was happy to learn that our potential school has developed and uses its own curriculum… and then disheartened to learn that this coming year they are switching over to state standard curriculum and will be doing state standardized testing as well. My heart sunk at this news. And the person hosting our tour wasn’t able to give me the names of any of the curriculum that will be used (it’s weird, apparently, that a parent might want such precise details of what their child will be learning). Perhaps the teachers themselves would be able to give me more information, but I’m not sure we’ll have the opportunity to be in touch with them about this before making a decision about registering. “It is common for ordinary parents, with no training in education, to homeschool their children and consistently produce better academic results than those of children educated by teachers with Master's degrees and in schools spending upwards of $10,000 a year per student-- which is to say, more than a million dollars to educate ten kids from K through 12. Sowell discusses all sorts of educational problems in early elementary schools in the first part of his book, Inside American Education, if you are interested in a good summer read. So here I am, where I’ve been a million times before, as you long-time readers know – face to face with my admiration of homeschooling. It comes down to this… wanting peace for my family. And the idea of homeschooling brings me more peace than any of the other options I’ve considered. And I’ve considered them very, very hard – praying that God would either give me peace about sending M to school, lessen my desire to homeschool, or just out and out give me information to prove me wrong. The opposite of all of these things has been happening – I feel less peace about sending M after learning more about this particular school, my desire to homeschool is growing, and all the information I’m finding is making me more and more certain that conventional schooling is not the road to go down for the best education for M.
The heartbreaking part of this is that with current circumstances (my husband has reservations about this, and I do feel he should have the final say so we can be sure we are doing the right thing) I have to be open to the idea that this is not God’s will for our family at this point in time. But I feel so conflicted about doing something I don’t believe is the best for my son, thereby not being the best mother I can be and am called to be. What’s a mama to do in a situation like this? Here’s the idealistic little picture in my head of a unified education, where learning is not a separate activity, done somewhere else, among other people, but as part of the whole of a child’s life: a child in a one-on-one setting, with a nurturing grown-up’s arm around his shoulder, teaching him to read, to solve math problems, to love God, to love his neighbor, to learn about the wonders of nature via science, to learn about the creativity in his heart via art lessons, to learn about history, music, chores, being polite, everything under the sun (! )… along with a lot of affection, firm discipline, encouragement, guidance in all things related to mind, heart, and soul, all in a real-world setting of family and community (versus an artificial environment where everyone is the same age and treated as if they are all at the same developmental stage)… a holistic education of the entire individual, by someone whom God has placed in a position to really know and understand and deeply love that particular child – the way He loves that child – as an individual. And, to me, that sounds like a mother doing the work God has given her by entrusting these little souls to her and her husband. I have to wonder if, when God created families, He thought it would be best to take the children away from their families several hours a day in order to educate them – or did He place them in their particular families with the intention that education would, for the most part, happen there? And it’s an idealistic picture, yes, I know that. And I’m pregnant and emotional, and not the best at dealing with reality right now – yes, I know that too, which is why I’m thankful to have a more objective husband. But I’ve been on this road for 5 years now and looking back I can clearly see how this dream has developed and blossomed in my heart and maybe my current state is just an honest admission of what I’ve wanted to believe and say all along. Barring any major change in our circumstances, having a baby will keep me at home for another 5 years. I’d love to have both of my chicks nestled under my wing (I’ve had to let too many of them go too soon – maybe that is part of this too? ), all of us learning together… and there are some practical and financial advantages as well. Taking advantage of homeschool groups would be a large part of this too; I have no desire to suffocate my children or prevent them from being part of a larger community. Am I being too overprotective? Too controlling? Hm. Perhaps. But I do know that someone is going to be in control. If M goes to school, the system will be in control of what is being taught; teachers will be in control of whether he is learning as well as how he learns (so often you hear, “teacher wants us to do it this way, not that way, despite the fact that that way might be correct too, which I’d have to say undermines the intelligence and authority of the parent who might be just as correct); other children will be in control of his socialization (social skills should be taught by mature adults and older children, I firmly believe), and their actions and words will control, at least in part, how his personality develops – monitoring may be done by an adult, but the real learning of social skills will be taught by his peers. It seems to me that if someone is going to be in control of these things, and we know someone must be, that someone ought to be the parents. I am simply unsure of where to go from here. I pray for the strength to trust that all things will work out for the best, despite the possible heartache of.going against my convictions… it’s a tough place to be for this mama. Hello there, friends. :) I am back from my fall off the edge of the earth. I *just* remembered that I have a blog. And that I have a lot of unfinished projects pertaining to said blog. And that it’s always after I prematurely announce said projects (migrating printables to new site, opening Etsy store, upcoming blog posts, etc.) that life takes over and everything is left half done. Sigh. I have not forgotten that I am pregnant, although I may be in denial about how much energy it takes to grow a baby and how having a body twice its normal size can considerably slow a person down. And I may have forgotten once or twice that I have a husband and son. Apparently pregnant me is not all that big on reality… preferring instead to escape into a good book or barring that, escape by being just grumpy enough to scare everyone away for a while. I have been about as stellar of a wife and mother these past few months as I have been a blogger. I was given the okay to do more about a month ago (we are currently at 29 weeks), and things have brightened up since then. We did take a trip to Missouri to visit my family prior to that (in which I did nothing except sit on my mom’s couch and eat home-cooked food), and since being given the okay to do more I’ve felt better. But I can’t do all I want to – I get tired! I’m huge and I move much, much more slowly! I’m temperamental and emotional and you’d be surprised at how much time goes by during a good crying session, or how much time the endless apologizing takes up! My feet swell up in the middle of productive times and I have to go lie down and put them up instead of actually accomplishing something – curse those feet of mine! But, I’m back on caffeine and that makes things a little better. No sugar, no salt, hardly any carbs (I’m borderline gestational diabetes, and have had some bouts of high blood pressure)… so you are not going to take my one cup of weak coffee away from me. No. SO… I have been sewing up a storm, and neglecting everything else. Snipping tight-busted-dresses into halves and making them into soft-waistbanded skirts, altering other skirts so they have soft waistbands… sewing some things from scratch, and even drafting my own patterns. Whew. The energy that was going to go into creating baby things for my store (and my baby) has been re-directed into a desperate attempt to clothe my growing self. I’ve learned a lot, and have been frustrated a lot, but I have a working wardrobe and that is what matters. A wonderful friend sent me a fancy dress and two extra skirts plus a couple of t-shirts, and I think I am set until the end of this here thing, unless we have cold weather because I have no pants that fit. But I’m not thinking about that. Busy, busy, busy, I’ve even made two pairs of dress pants for M, which he decided to outgrow within 2 weeks, thankyouverymuch. Wanna see some of what I’ve been up to? Of course you do! cotton dress, fully lined, made from a maternity pattern which had to be altered 10 times in order to not look like a tent. However, I LOVE how it turned out. quick dress I made from a t-shirt and cotton fabric – no pattern, just wrapped that fabric around my waist and gathered it to the t-shirt – love this one too! another comfy skirt made from a dress I cut in half, with another comfy waistband. skirt from my friend that I altered to have yet another knit waistband (can’t see it in the pic, but it’s a wonderful long, soft, slinky skirt. shirt from a pattern that I altered to have a gathered neckline – so cute and simple, and LONG enough to cover my tummy; why are maternity shirts never long enough?? an attempt at capris – fully lined – from a pattern I drafted myself using measurements. They are far from perfect. Pants are a hard thing to get just right. shorts sewn from another pattern I drafted myself – love them. Flat-front waistband with elastic in back, I wear these every day. They really need to be washed. A little nightshirt for M from the softest knit cotton ever. Also drafted this pattern myself – with raglan sleeves, which were super easy. Hope you are having a wonderful spring/ beginning of summer!